Perry senior Delaney Eiteman putts during Saturday's Jayette Invitational. Photo courtesy Joel Happel. Four teams joined a two-member Perry squad Saturday for the Jayette Invitational at the Perry Golf and Country Club. DC-G won the team crown with an 18-hole total of 387. Dowling Catholic shot a combined 421, Norwalk a 441 and Humboldt a 465. Senior Delaney Eiteman carded a 52-49–101 for Perry, with junior MaryLou Ledesma posting a 66-67–133. Eiteman had three pars and a birdie while making the circuit. Frances Carlson of Humboldt was the overall medalist with her 40-44–84, with Humboldt’s Nora Carlson (43-45–88) and DC-G’s Lydia Skeier (46-42–88) tying for the second-lowest card. Others scoring for DC-G included Aubree King (46-48–94), Emerson Kleis (51-49–100) and Kaylin Patrick (57-48–105), with Annagrace Dalbey (57-58–115) and Morgan Stork (59-62–121) also playing for the Fillies. Dowling Catholic was led by Maddie Baldwin’s 45-49–94, with Abi Sachs shooting 49-51–100, Rchel Calhoun 5405200196 and Lindsey Grask 56-65–121. Sarah Rush (65-60–125) and Kristin Wenham (72-62–134) competed for the Maroons as well. Emily Ellis (49-48–97), Taylor Gassman (53-56–109), Katie Johnson (58-57–115) and Ashley Luedtke (57-63–120) provided the four scoring cards for Norwalk. Also playing for the Warriors were Kailee Elsen (72-50–132) and Audrey Doerfeld (68-68–136). 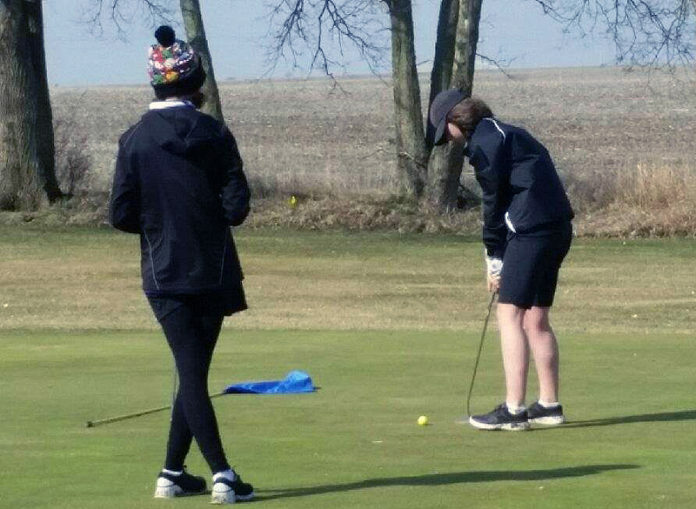 In addition to the cards from the Carlson sisters, Humboldt had cards turned in by Ashlee Weigeland (69-73–142) and Chloe Mayall (77-74–151). Perry will join Carlisle, Des Moines Roosevelt and Bondurant-Farrar for a quadrangular in Pleasantville Tuesday before visiting the ever-tough TCI course in Polk City to face North Polk Thursday. Happel hopes to have a nearly-full squad on the course for practice Monday, the first time this season many will see the course, as the school musical and other duties have limited participation.